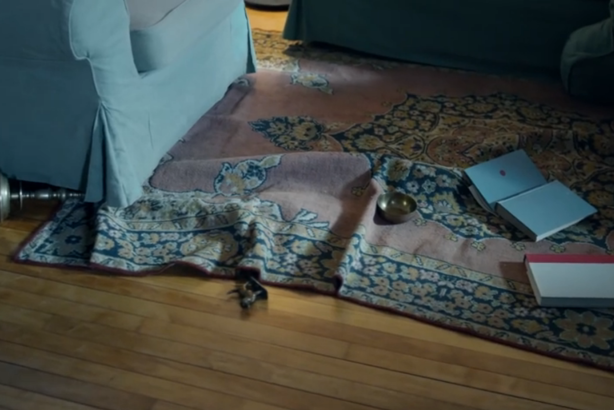 The chilling PSA from No More and the NFL shows images of a house in disarray. NEW YORK: No More and the NFL are trying to make domestic abuse an issue people aren’t afraid to talk about and act on, a message they’re reflecting in a powerful PSA set to air during the Super Bowl on Sunday. The No More campaign works to encourage bystanders to take action when they’re aware of domestic violence situations, said Jane Randel, No More cofounder. "For so long, the conversation has been hidden and in the shadows," she said. Released this week, the PSA by the NFL and No More depicts how difficult it can be for a victim to talk about domestic abuse. In a real 9-1-1 phone call, a woman places an order for pizza to a dispatcher who quickly realizes the caller is speaking in code out of fear of her abuser who is likely still in the home. Images of a house in disarray – a fist-sized crack in the wall and a shattered frame once holding a woman’s photo on the ground – flash across the screen. "It’s very compelling when you watch the ad to realize the bystander in this case is the person answering the phone and understanding what’s going on," said Anne Glauber, Finn Partners managing partner and cofounder of No More. "The fact of the matter is we’re all potential bystanders to this issue." Randel said one of the campaign’s goals is to make the conversation about preventing domestic abuse one that happens regularly, more like other prevention-focused issues like breast cancer. No More wants its symbol to be easily recognizable, like recycling arrows, so that any organization or effort to combat domestic abuse can use it to "gain awareness and resources of their own," Randel added. The timing of the PSA plays a role, too. Airing it during the Super Bowl means a massive audience will be watching, including millions of men. Randel said the target audience includes men and youths. She noted the PSA will mark the "first time domestic violence and sexual assault have been represented in the Super Bowl." The NFL has also been working to improve its image on the issue for the last few months. Commissioner Roger Goodell was criticized in September for his initial handling of an incident involving former Baltimore Ravens running back Ray Rice amid a spate of domestic violence occurrences involving NFL players. In the long term, Randel hopes the NFL’s campaign with No More will inspire other companies and organizations to also make the issue their own. "Having this ad playing is just an unprecedented opportunity," said Glauber. She added that since the NFL started running PSAs during its regular season, "calls to the national domestic violence hotline have skyrocketed," and "numbers of people going to NoMore.org have tripled." In an emailed statement to PRWeek, the NFL said it plans to continue working with No More. "Our work with them has shown us the power of uniting sexual assault and domestic violence groups with one voice and one message to make a change. We are proud to play a small role in their important work," the league said in a statement.